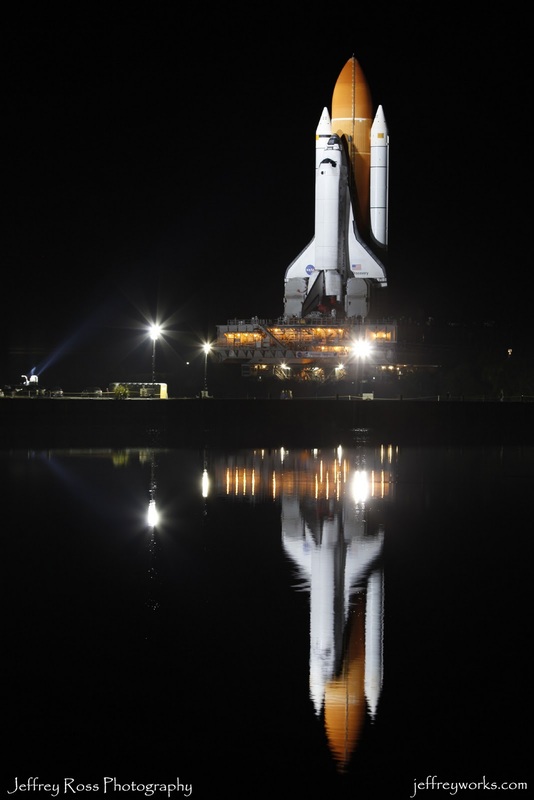 The Space Shuttle Discovery rolled out to the launch pad again this evening. 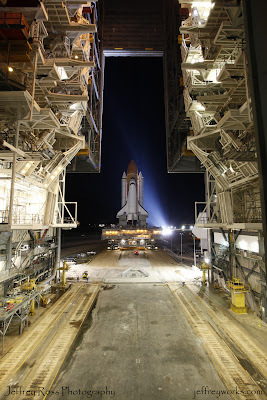 It is the second trip to the pad for this launch, but I'm hopeful that everything will go right this time. 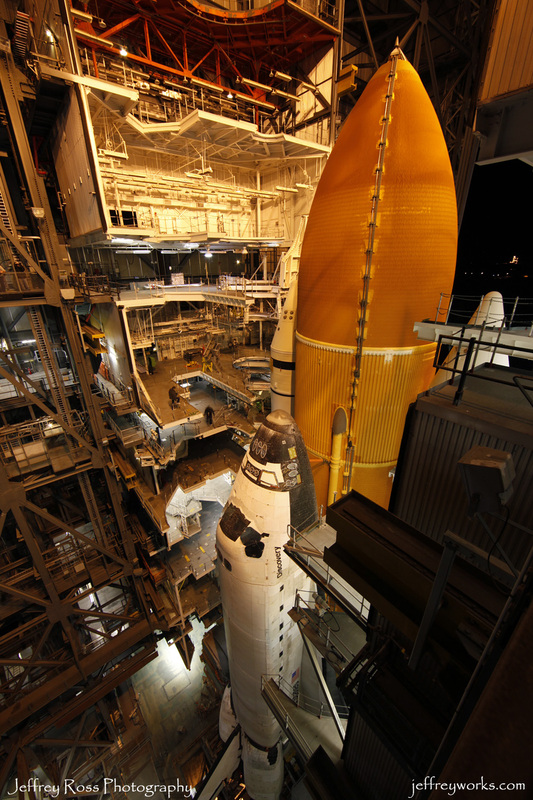 This is the Discovery inside the VAB (Vehicle Assembly Building) before it began moving. I'm on the 16th level here looking down on the orbiter. You can see the open doors to the right, and if you look really hard you can see the small dot of light which is the launch pad in the distance. Discovery will reach there sometime during the night. The shuttle and external tank are sitting on the giant crawler. And here it has just started moving. I'm on the 5th level for this shot. 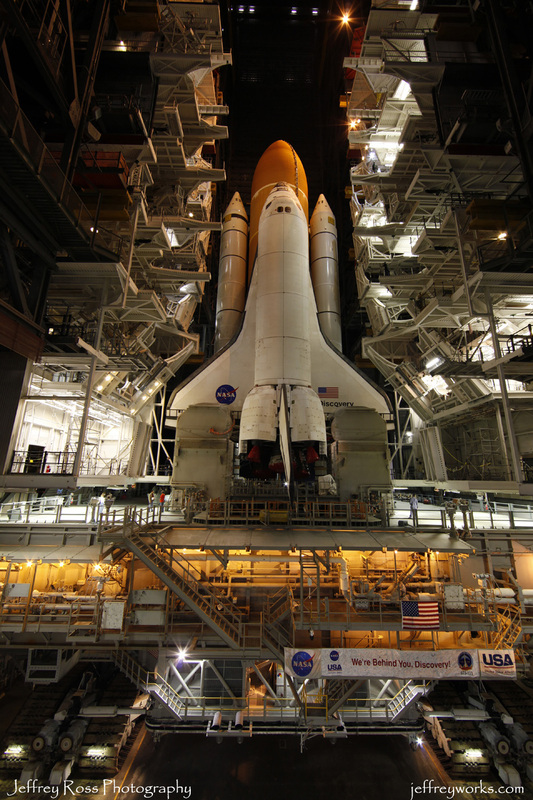 And I can tell you that when the crawler fires up its engines, this location really fills up with an exciting level of exhaust fumes. Once it gets far enough outside the building they fire up the big Xenon lights. The employees and their families are gathered a few hundred feet away on the right side of the shuttle. And finally here she is, slowly creeping her way through the night. It's almost one in the morning now, and I need to be up at 4:30 to be back out to KSC for more photos... stay tuned! What an honor to be there Jeff. The photos are awesome. This Could Be The Day!